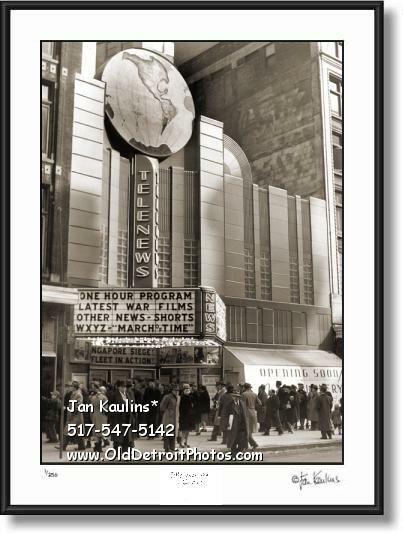 OLD DETROIT 1942 TELENEWS THEATER Detroit black and white photo print photograph picture for sale. This sepia toned black and white restored old Detroit Telenews Theater black and white photo is made from an original 1942 Wordl War II vintage black and white Telenews Theater photo print. This Art Modern Detroit TELENEWS newsreel theater featured a giant convex map of the world as part of the facade, and a 'news foyer' instead of a conventional lobby. A teletype machine kept patrons right up to the minute with the latest news. There was a working radio studio in the basement, and WLBJ originated news broadcasts here occasionally. The Telenews Theater was located at 1540 Woodward Avenue in Detroit. It was built in 1942, the year of this historic Telenews photo offered here. This was a very important venue as it was in the midst of World War II, and venues like this offered the most up to date news available at that time. The crowds outside gather to hear the latest news of their loved ones during World War II. The theatre has undergone several owners and venues since opening in 1942, and most recently was an electronic dance club.